Michael John McCarthy was born on 10 November 1963, in Pittsburgh, Pennsylvania USA, to Ellen and Joe McCarthy, of Irish descent. He is an American Football coach, best known as the head coach of the Green Bay Packers of the National Football League (NFL), and who led his team to a win in Super Bowl XLV. 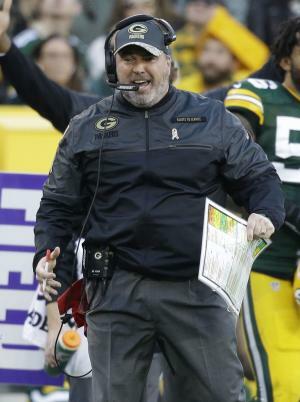 So just how wealthy is Mike McCarthy? Sources state that McCarthy has established a net worth of over $7 million, as of early 2017, the main source of his wealth having been his coaching career. McCarthy grew up in Pittsburgh, along with his four siblings. He attended Bishop Boyle High School in Homestead, Pennsylvania, and later enrolled at Baker University in Kansas, earning a degree in Business Administration. He played as a tight end for the school’s team, the Wildcats, leading them to an NAIA Division II national runner-up finish. In 1987 he was hired as graduate assistant at Kansas’ Fort Hays State University, where he was studying for his master’s degree in Sports Administration. The following year he returned to Pittsburgh and began working as graduate assistant at the University of Pittsburgh. In 1992 he began coaching wide receivers, and in the off-season working on the Pennsylvania Turnpike. In 1993 McCarthy became an offensive quality control coordinator for the Kansas City Chiefs in the NFL, and two years later the quarterbacks coach. In 1999 he moved to coach quarterbacks for the Green Bay Packers, and then served as the offensive coordinator for the New Orleans Saints from 2000 to 2004. The year 2005 saw him taking the position of offensive coordinator for the San Francisco 49ers. All added to his net worth. The following year McCarthy became the head coach of the Green Bay Packers. In 2008 the team signed him to a five-year contract extension, raising his salary to $3.4 million a year. His wealth was considerably boosted. After a struggling 2008 season, he led his team to impressive results in the following years. From 2009 to 2015, their total victories ranked No. 2 in the NF, and the team reached the play-offs in every season over this span, which had never been achieved by the team before McCarthy. In 2010, with a 31-25 win over the Pittsburgh Steelers in Super Bowl XLV, he led the team to their Super Bowl title, being only the third coach in team’s history to do so. From 2011 to 2014 the Packers took four straight NFC North Division titles, being the only NFC team and one of only three NFL teams to do so. During his 11-year tenure with the Packers, McCarthy has had a 112-62-1 overall record, his percentage ranking him No. 2 among head coaches in the NFL. His tenure has been one of the longest one in the NFL. When it comes to his personal life, McCarthy has married twice, firstly to Christine from 1990 to 1995; the couple has one child together. As of 2008 he has been married to Jessica Kress, with whom he has three children, while also adopting her two children from a previous marriage. McCarthy is involved in philanthropy too. He has been a crucial part of the Mike McCarthy Cystic Fibrosis Celebrity Golf Open, aimed at benefiting various cystic fibrosis organizations, as well as Mike & Jessica McCarthy Golf Invitational, benefiting the American Family Children’s Hospital. He has founded the McCarthy Family Foundation to provide help for a number of charities, projects and institutions, including Autism Society of Northwest Wisconsin, Green Bay Boys and Girls Club, Greenfield Baseball Association, Jackie Nitschke Center, St. Mary’s Hospital Medical Center, Midwest Athletes Against Childhood Cancer, among others. 1 Named Head Coach of the Green Bay Packers on 12 January 2006.